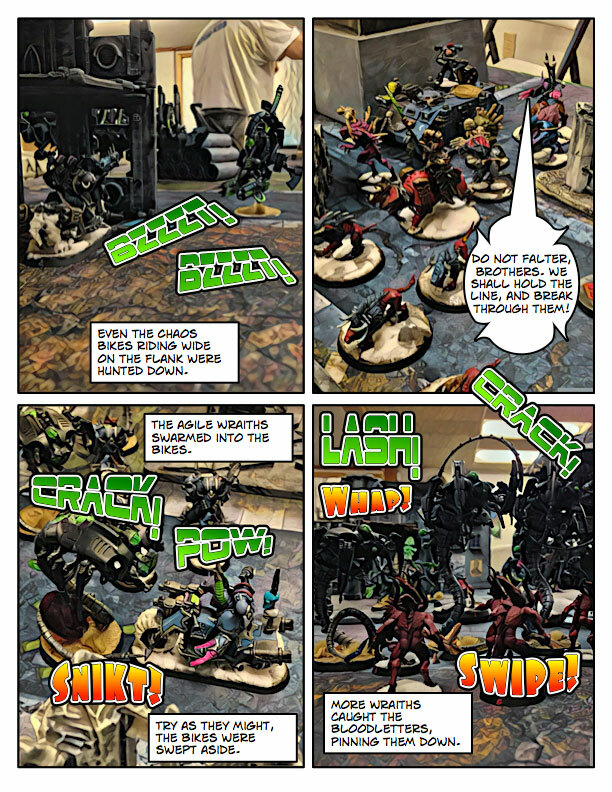 Yep, another comic book battle report! 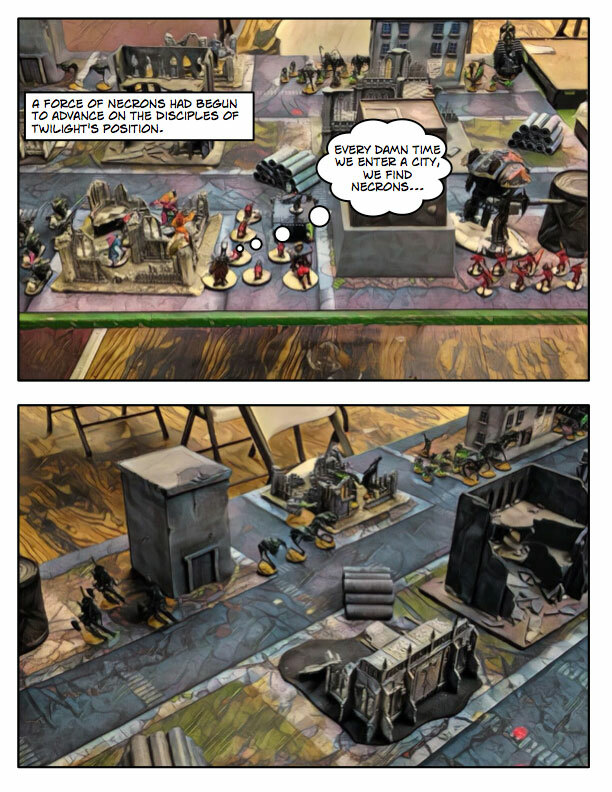 I’ve grown to really enjoy doing these because it suits my approach to battle reports: short, sweet, and to the point. 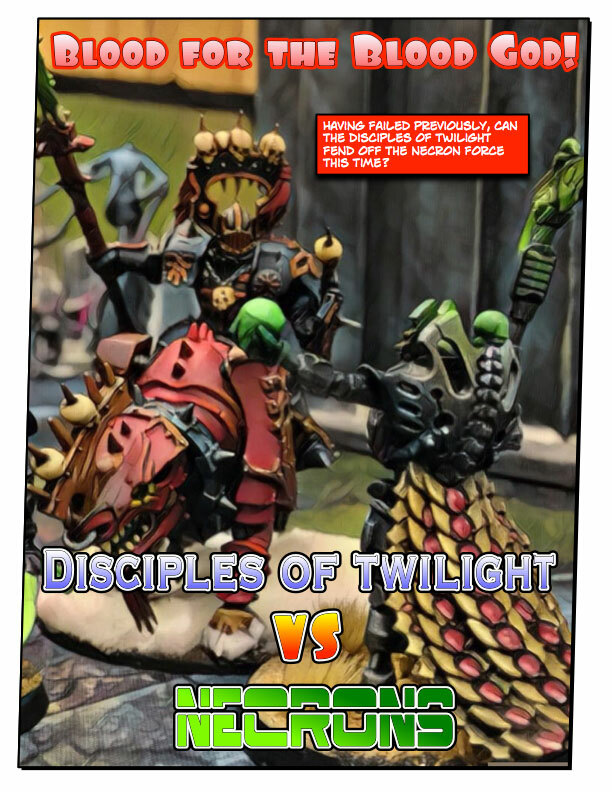 This week we have the Disciples of Twilight – playing as Khorne Daemonkin, against the Necrons. 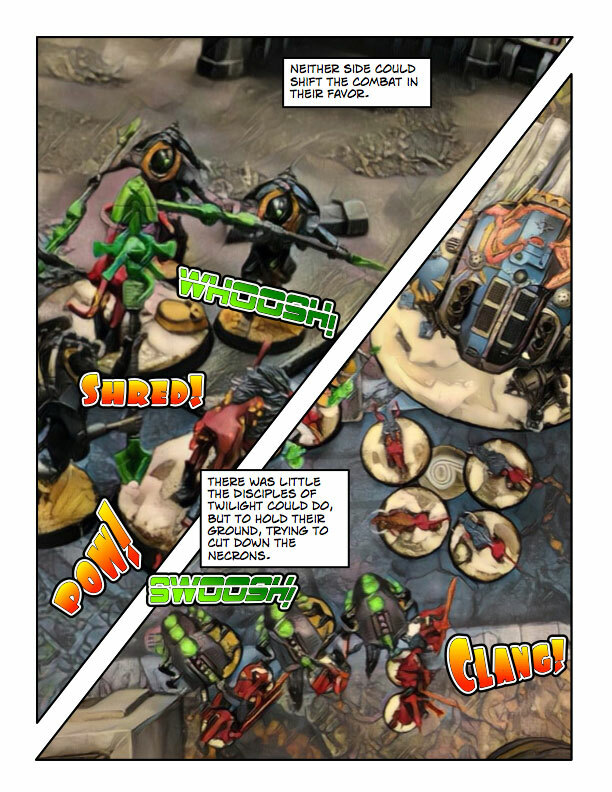 This is the same player, and Necron army, that I faced in the first comic book report I did. 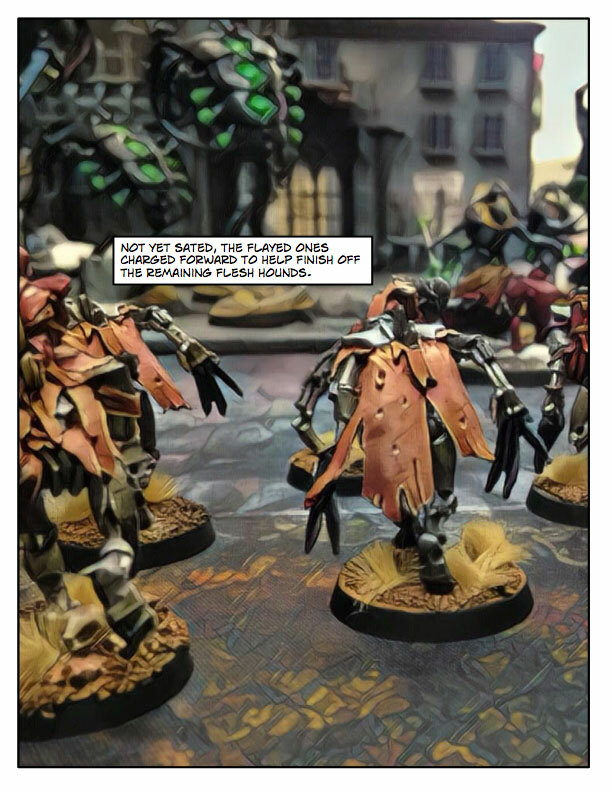 Kenny’s Necrons just look so cool when the filters are applied that I had to do another. The game we played was a 1,750 game to practice for a tournament this month. I kept the same list I had last week with a few subtle tweaks. It’s too close to the event to rock the boat. In short, it’s a KDK CAD with a Gorepack formation. Pretty simple. Kenny stuck it to me early in the game with assaults. I slowly but surely continued to lose most of those combats. 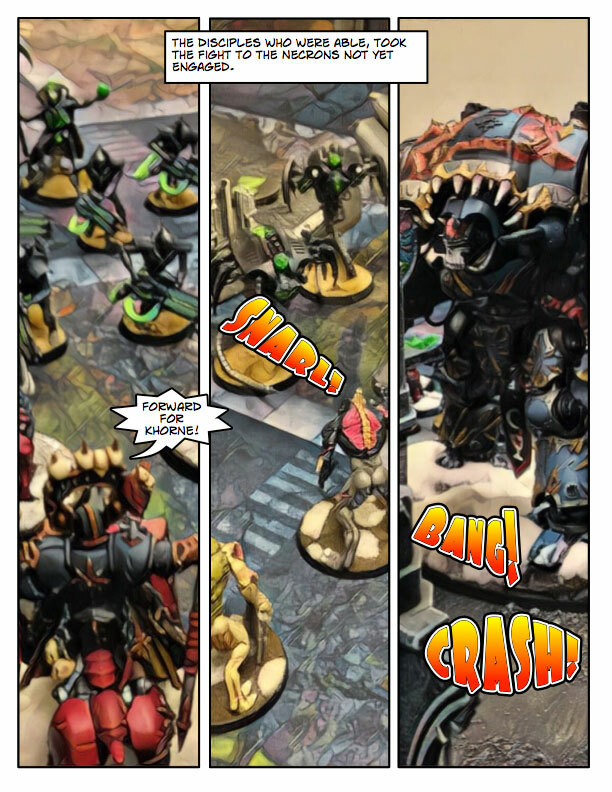 Necrons were destroying Khorne Daemonkin in combat! Kenny had the right idea though, deny me the charges and just feed me bodies. The game came down to 1pt. We went into turn #7, with me at the bottom of the turn. I had 4 cards in my hand, and only one I could accomplish, Big Game Hunter. 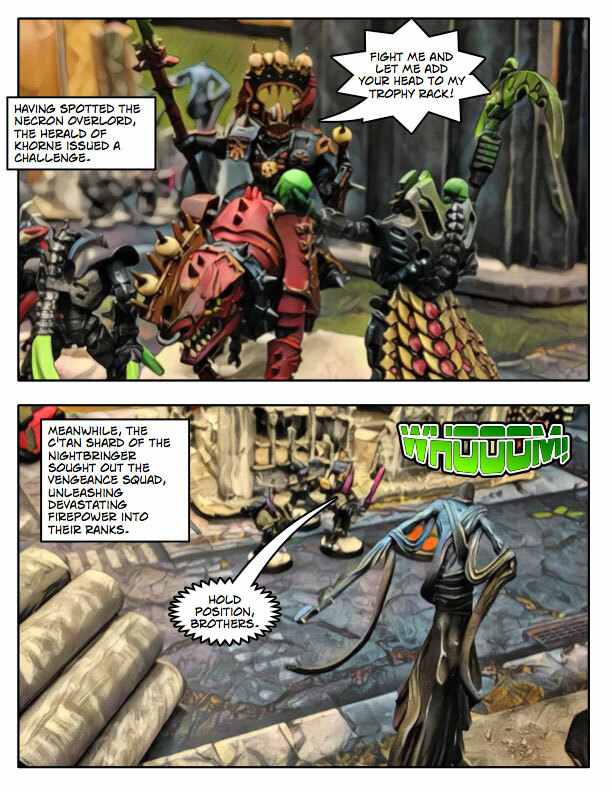 The only thing I had left on the board was Soulgore (Chaos Lord), 1 Chaos Marine, and 3 Bloodcrushers. 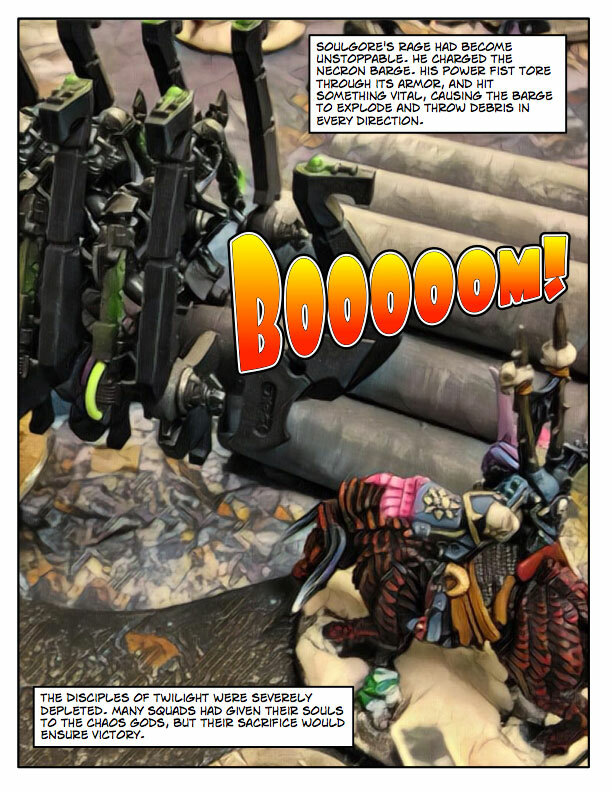 I sent Soulgore after that Barge, and as the comic showed, he exploded it to give me the 1pt victory. It was a hell of a game, neck-and-neck every single turn, and it came down to a single dice roll. I can’t complain about that in the least. 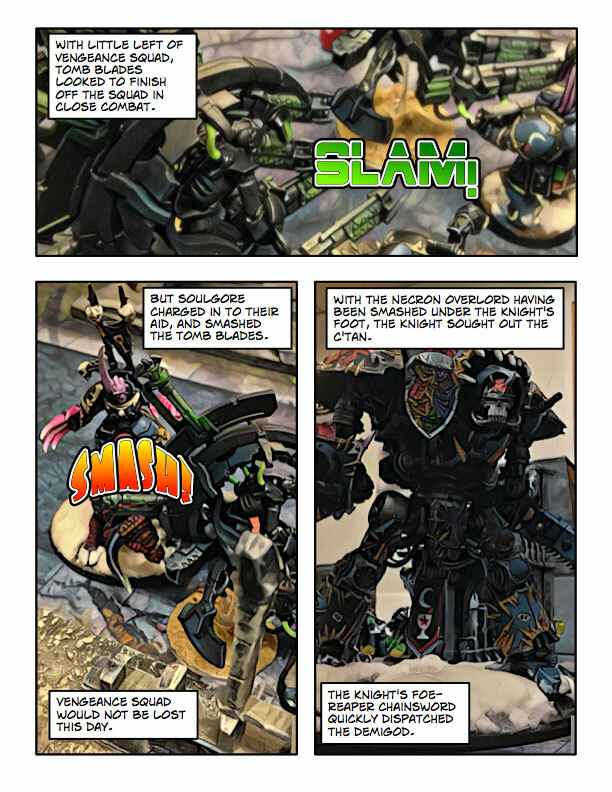 Another great and well done comic! 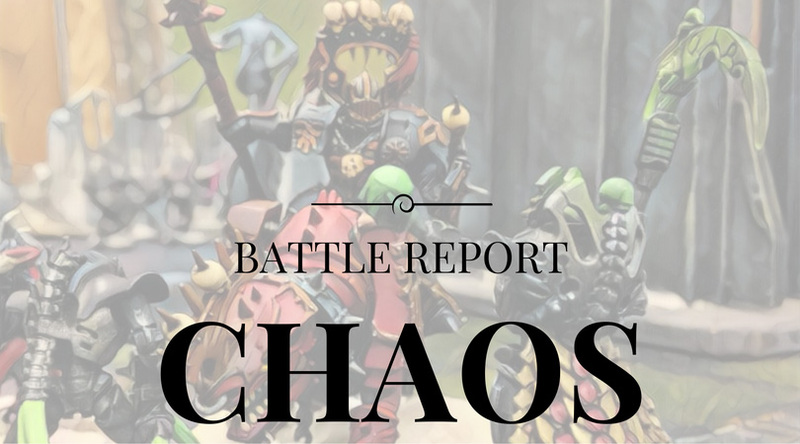 I love reading your recent battle reports in this format. How do you go about applying the stylistic filters to pictures? I use a phone app called Prisma. It’s got a ton of great image filters. I highly recommend it, and it’s free. It makes what you see there, or the Crypt Horrors, which is the version I used. I like the Spawn kit, but the price is cheaper per-model with that kit, and I think they look cool. I used Prisma a few times when it first came out, but hadn’t had much success or found a good filter. I may have to give it a whirl again. I really like the style that comes out of the one you’ve been using. I’ll have to keep that kit in mind. 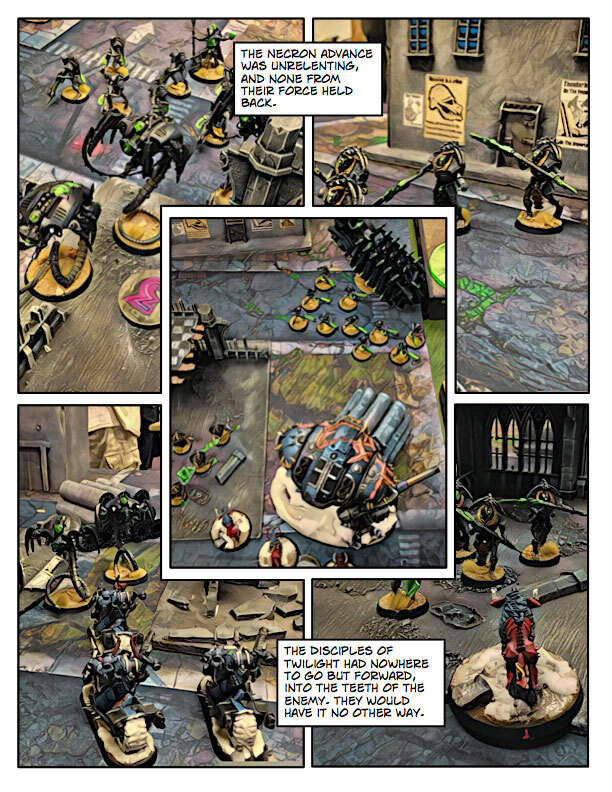 I’m not a huge fan of the Spawn kit as I’m picturing spawn as somewhere between man and daemon. Those crypt horrors look like they’d provide a good base for some conversions to fit the vision I have for spawn. I’m using the Tokyo filter, but at 50% intensity. When it’s dialed up to 100% it can just be too hard to make things out. I think they’d make a great kit to convert off of. Good stuff Thor. You are really getting the hang of this style. 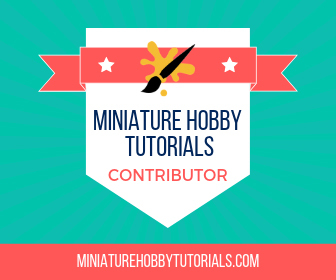 How are you enjoying KDK now? Been having good luck with them lately. There’s still stuff I’m missing (units), that I’d like to get, but I’m making it work. Please put a pew pew pew onomatopoeia, the cherry on the top of a great cake!!! 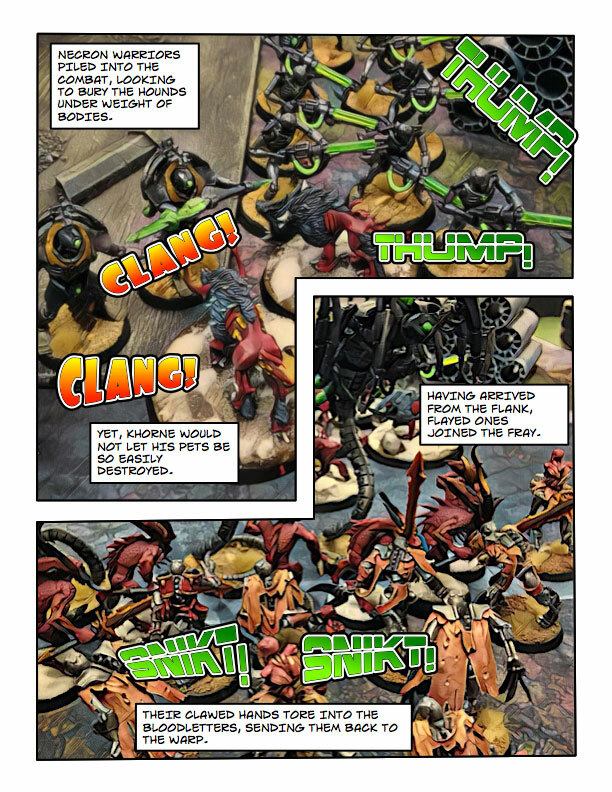 Very much enjoying the format of the battle reports. I think there is space for you to expand on the game a little more without ruining the format. I think you’re right. 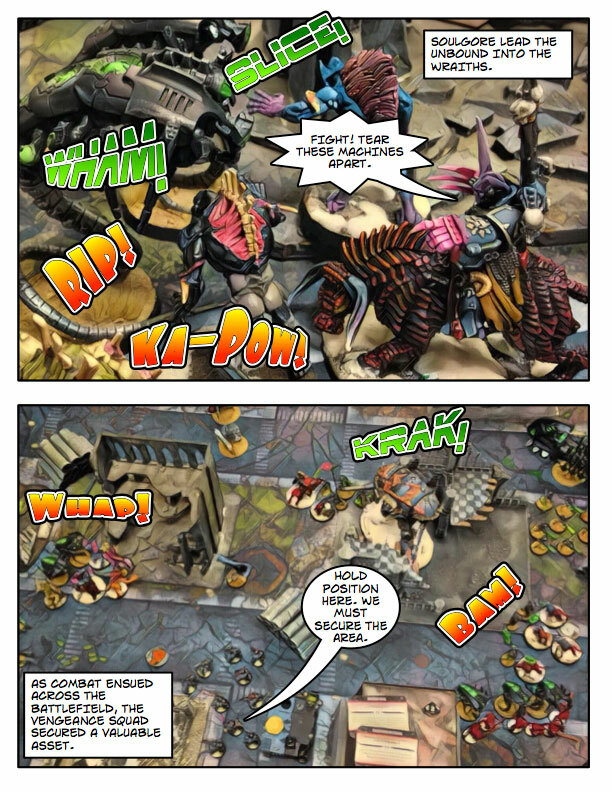 I could definitely do more to explain the battle more. We’ll see how the inevitable 4th one does on that front. Great work and an awesome victory! It was a tie game, and my win came down to a few rolls in close combat. Love it when it’s decided like that. If you’re on a Mac it’s easy, but I’m sure there’s freely available software for Windows too. I know there’s a phone app that does it, but I haven’t used it. The images are done with Prisma (phone app). Really like the style this is done in. It’s a lot of work, but I enjoy putting it together.